IVV stands for “Internationaler Volkssport Verband” which is translated as the “International Federation of Popular Sports”. IVV is an organisation founded in 1968 by clubs from Germany, Switzerland, Liechtenstein and Austria, to encourage “unforced” walking as a healthier activity for the general public, in contrast to the numerous running clubs and organisations which had strict time restrictions, and which were not suitable (and a source of injuries) for the untrained. The IVV concept has been broadened to include cycling, swimming and cross-country skiing. The IVV concept has been embraced by numerous other countries around the world, and National IVV Associations have been set up to organise, control and administer IVV accredited events within their countries. In countries where there is no national organisation, individual clubs may become members. The Canberra Two Day Walk Inc. became one such direct member club in September 1999. In 2016, AussieWalk IVV was formed as a national association to manage the IVV program in Australia. Australia was subsequently endorsed as a National Member of the IVV at the international IVV Congress in Brazil in November 2016. In March 2017, Australia became a member of IVV-Americas, one of three Continental Associations of the IVV, which covers North and South America and Oceania (the others being IVV-Europe and IVV-Asia). To promote peace and understanding among peoples through friendships developed between participants from different countries at (IVV) events. To encourage and recognise repeated participation in IVV events, an award system has been set up. The award system recognises both the number of events completed, and the total distance covered. For number of events : 10, 30 and 50 events, and thereafter in steps of 25 to 600 events. Then in steps of 50 to 1500 events, and thereafter in steps of 100. For total distance covered: In steps of 500 km to 8,000 km, then in steps of 1,000 km to 22,000 km. Then for 25,000 km, and there after in steps of 5,000 km. The award system only applies for participation in, and completion of, IVV sanctioned events. In the case of walking events, the minimum distance is 5 km. The performance(s) are then stamped into the appropriate IVV award record booklets/cards. There are separate “Events” and “Distance” record books. Current cost for a record booklet is AU$10. In Australia, the cost of the record booklet includes the cost of the relevant award. In some countries the awards are purchased separately if desired. Record books can be used anywhere in the world where sanctioned IVV events are held. New walkers can purchase an introductory kit that has both an event and distance book plus a coupon for 3 free walk stamps for only $10. Events leading to an award step may span a number of years and IVV record booklets/cards bought in one country may be used for IVV events in any other country. Award booklets are not transferable. 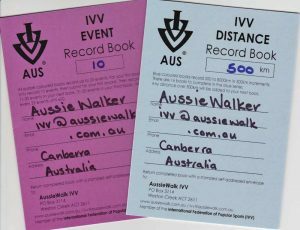 Registered participants in the Canberra Walking Festival will get free IVV credits as part of their entry fee, if they have purchased an IVV record booklet (event and/or distance). There are also several other permanent trails that can be done in Australia for a nominal fee, with World Walking Day in May and the St Nicholas Embassy Walk in December each year in Canberra being free events. In addition to the standard IVV awards described above, there are numerous Special Award Programs which have been developed in Australia and internationally to add further interest and incentive for walkers. These can be completed in parallel with the standard IVV awards, or even undertaken separately. If you want to know more about the IVV program please see the Frequently Asked Questions (FAQs) for Walkers. If your walking club would like to be a member of AussieWalk IVV, see our FAQs for Walking Clubs. If your walking group or club is touring Australia and want information on sanctioning walks, see our FAQs for Visiting Tour Groups.